The translation was in the main got up by me some twenty years ago as a part of my pursuit of a comprehensive answer to the question, ‘What are the rhythms of English Poetry?’. Now, the matter of rhythm in English poetry has for long pre-occupied me: how best to perform the wonderful pieces that we have, starting in the present day and going back to the seventh century. 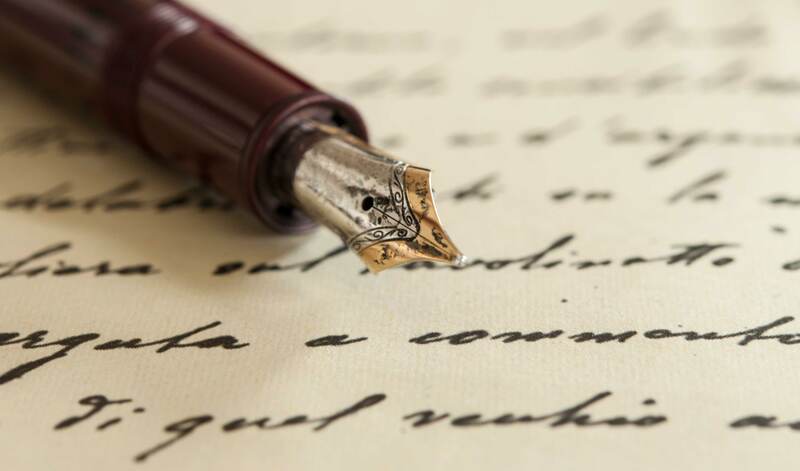 It is my contention that the way a poem goes ~ that is, how it is formed, what rhythmic structure it has, what ‘soundscape’ it has, shall we say ~ is as important as what is actually conveyed in the meaning of the words. Schemes for scansion of poetry which are based on what may be termed ‘classical’ or ‘neo-classical’ systems using ‘iambs’ and ‘trochees’ and such, based on procedures concerned with making and analysing ‘quantitative verse’ in other languages, do not seem appropriate and comprehensive enough in the treatment of English verse. A book on a simple method of ‘musicalistic scansion’, together with an illustrative CD, is in preparation. But I have been applying such a method to the performance of Old and Middle English verse, in the original language and in my own ‘translations’, for many years. So far I have worked on The Wanderer, The Dream of the Rood, and parts of Beowulf; with the thirteenth century Sir Orfeo; and the whole of Sir Gawain and the Green Knight from the fourteenth century. For nearly twenty years I have been making the boast that I have, as it were, uncovered the truest solution to the question as to ‘What is the rhythm of “Beowulf”?’ As some evidence for this I made those recordings of The Wanderer, and also a CD called The Pulse of Flame in which I apply the same theory and practice in the performance of English poetry up to modern times. With regard to the earlier texts, I sought to make them comprehensible and enjoyable to all sorts of people who like a good song or story but who might not be able to read such pieces themselves, to make such wonderful poems as ‘immediate’ as possible in both meaning and rhythm. And, of course, I want to present a theory of rhythmic analysis and performance to those who know much more of Old and Middle English poetry than I do. But I do not here present a full rhythmic analysis of the lines of verse. This ‘paper’ is more concerned with matters of ‘translating’ the ‘word-stuff’ in the verses, while at the same time acknowledging that the ‘meaning’ of the words is given an especial temporal flow in the ‘speaking’ of them. That flow is in a sense a part of the meaning; so it is necessary to indicate a structure of main ‘stresses’ in the verses. I may then add briefly here that my proposal as to their rhythmic shaping is that they move to something of a triple-time rhythm ~ ‘3/4’ time, or even a slow’6/8’ rhythm. This theoretical analysis of the rhythm of Old English verses is demonstrated in practice in my recorded performances of them here; and I have ‘translated’ that rhythmic scheme into my own versions of the lines. I must ask my readers and listeners to ‘use their ears’ to understand the musicalistic setting. To use a picture: my apprehension of the general rhythmic nature of the Old English verse line is that it is much like a long-boat afloat in harbour. The swell and chop that lifts and rocks the craft is to some extent regular; but at the same time it is infinitely variable. I have no time for prosodic systems which categorise lines or ‘half-lines’ into a number of types. There is to my ear only one, ever-changing line moving to the chop and swell of the ‘sound-and-sense-substance’ of the verse. With regard to The Wanderer, my earlier perceptions as to the prosodic structure of the Old English verse line have not changed much over twenty years. In fact my reading of it has become somewhat entrenched as a result of my translation work on Sir Orfeo and Sir Gawain and the Green Knight. The latter poem, in the alliterative style, appears to me to be in the same prosodic and rhythmic mode as is The Wanderer ~ and as is Cædmon’s Song, to which I shall come later. The general structure of the Old English line is not in doubt. There are four ‘staves’ or main beats or stresses in each verse. The ‘full’ alliterative pattern is a linking of the first, second and third staves; and this is the most common form of the line. Otherwise, the first and the third staves, or the second and the third staves will alliterate. Very occasionally the fourth stave will alliterate with some or all of the others. It is generally accepted that a verse-line in Old English is in two ‘halves’, with a real or notional pause or break between them. It appears to me that each half-line has in it one ‘measure’, in a musical sense ~ though it is possible to say that this is one larger measure subdivided into two, or is even two measures. In the performance of these lines we must bear in mind the use in Old English of the word sang or song and of the term sang secgan to describe verse-making and performance. We know that there was some sort of musical accompaniment when such works as The Wanderer were delivered; but it is unlikely, given the variation in the number of syllables in each line ~ the amount of ‘sound-stuff’, shall we say ~ that there was a fixed tune to a piece, or any full tune in the modern sense of a known and repeatable sequence of fixed, timed notes. Perhaps the lines were incanted in the way that Old Testament psalms may be now. My own technique is to recite the lines as notionally equivalent, to give the measures in each half-line as far as possible the same ‘temporal spread’, using any anacrusis as the ‘run-up’ to the measure. So I deliver the measure gæstlic bið with much the same time-value as hryðge þa ederas. The overall effect that I try to achieve is of apparent isochronicity between the four staves in each verse-line, and over a series of verses. But this seems to me to rush the delivery of the line in achieving isochronicity of the staves; and it makes the word halle somewhat insignificant. The ‘sound-shape’ of the original setting seems preferable. Indeed, it is possible to make a like shaping of these lines in The Wanderer : 1, 5, 6, 7, 8, 14, 20, 23, 27, 34, 48, 55, 62, 63, 65, 85, 87, 96, 97, 98, 107, 110 and 111. So we might say that, overall, one line in five is of an ‘unusual metrical pattern’. We may attend to three of these here; but before doing so we may introduce the term ‘fore-running’ to replace the word ‘anacrusis’. This ties in with the term ‘fore-stave’, as above, to indicate a significant beat or stress within any ‘fore-running’. In performance it is quite possible and satisfying to give the two measures more or less equal duration although they appear to differ in the amount of ‘sound-stuff’ in them. The long vowelling in eard-stapa is easily drawn out, and the syllables in earfeþa gemundig may be ‘danced’ through quickly so as to give the measures and staves approximate isochronicity. All this demonstrates an ‘a priori’ theory regarding the rhythmic shaping that the Old English verse-line took, a prosodic method at which I arrived some time ago and to which I have broadly held since. However, my first ‘translation’ of The Wanderer did not represent very faithfully the shape or the sense of each individual line, its ‘sound-and-sense-scape’. The best that can be said is that the ‘translation’ conveys the general sense of the verses and that the modern wording is recited on the recording in the same ‘generic’ rhythmic mode given to the performance of the Old English original. The further translation work that I have done in Middle and Old English has brought me to a more stringent approach to the ‘game’, and to a way of doing things which is more faithful to the original lines and language in every respect. The intention is to satisfy a number of criteria or restraints in order to represent both the ‘sound-shape’ and ‘sense-shape’ of each verse. A second aim is to follow the same alliterative pattern in each line ~ not to the extent of trying to use the same key letter, but by following the pattern of alliteration stave by stave ~ as, ‘staves one, two and three’, or ‘staves two and three only’. A third concern is to be as closely literal in translation as possible, and to avoid ‘expressive’ or poetic ‘flights’. However, compromises had to be made, of course; which is why, for instance, geoguðe in line 35 has become when young and growing in order to satisfy the alliterative requirements for the line. And a further aim was to try so far as possible to use words in modern English that have their roots in the Old English. In this the translation is quite successful. A crucial act of boldness so far as I am concerned was in replacing the word ‘fate’, that I had earlier used as a ‘translation’ of wyrde, with the word ‘weird’ used as a noun. So easy! ‘Weird’ is not used as a noun in modern English; but it is not long ago that it was used as such in Scottish dialects. This ‘archaistic’ approach made it easier to be more rigorous in another respect. The aim in this translation is to maintain as much as possible of the original word order ~ not only in respect of the stave-words but with regard to ‘less important’ elements of the language. This increases the ‘archaic feel’. (With regard to the stave-words, it is only in a dozen or so half-lines that this intention has not been realised.) It is hoped that, by repeated listening to the verses, or through performance by reading and isochronously intoning them, it may be found that the ‘archaic feel’ of this translation allows the ‘spirit’ and ‘mood’ of the original to better enter ‘head and heart’. wadan wræc-lastas wyrd bið ful aræd. Wander his wretch-road: our fate is fore-written. wander wretched pathways: weird is all fore-read. of wrathful foe-slaughterings and the fall of dear kinsmen. healde his hord-cofan hycge swa he wille. Hoard his heart’s-wealth, howsoever he may think. holding his hoard’s-cove-ing highly as he will so. 16ne se hreo hyge helpe gefremman. nor the harried heart help may it come to. In hyra breost-cofan bindað fæste. keep fast closed the coffer of his weal. within their breast’s own cove-ing bind up fastly. Swa ic mod-sefan minne sceolde. 24wod winter-cearig ofer waþema gebind. Cædmon’s Song is a great wonder. It is a great wonder that we have it at all in the various copies of the Venerable Bede’s Ecclesiastical History of the English People. 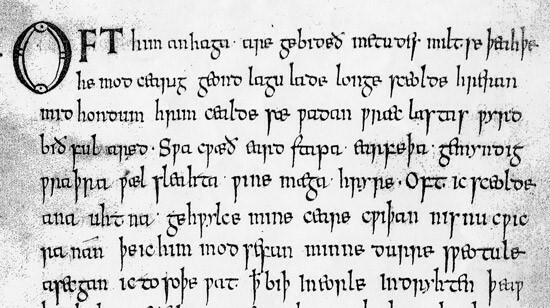 It is wonderful that its nine lines were written out in the vernacular ‘Old English’ at the foot of the page where, in Latin, Bede tells the story that had come through to him of the unlettered man who, in the time of the Abbess Hilda, had been struck with the power of shaping verses ~ a wonder which we do not doubt actually happened. heofon to hrofe, halig scyppend. eternal Lord, ~ created the beginning. heaven as (a) roof, (the) holy Maker. (the) earth for men, almighty Ruler. ever the godly one, all this did craft for us. the heavens on high, that holy shaper. who live in this land, a leader almighty. My thanks go to Dr Stuart Lee, and Oxford University, for the opportunity to put this work on the Woruldhord site.